Australian Geographic has published Life and Death as a feature image in their November / December 2014 edition. The honour came soon after the image was awarded ‘International Landscape Photo of the Year’ and topped off an epic year for the Byron Bay based photographer. “I am very humbled to have been asked and am proud of its inclusion. Magazines like Australian Geographic inspired me to pick up a camera when I was young and continue to inspire me to take my work that extra mile” said Craig. Life and Death was captured at Broken Head Nature Reserve in January after lightning ignited a bush fire that then raged for a week. Craig, who has been a professional landscape and nature photographer for 10 years, took the image using a camera mounted beneath a helicam once aerial water bombing had halted the fire. “This image represents a significant moment in time, illustrating the power of nature and its ability to create life and destroy it”, said Craig. “When I set out to take the picture I was aiming to create a unique and abstract portrayal of the Australian landscape and I’m stoked it has been so well received”. Life and Death is available for purchase HERE. 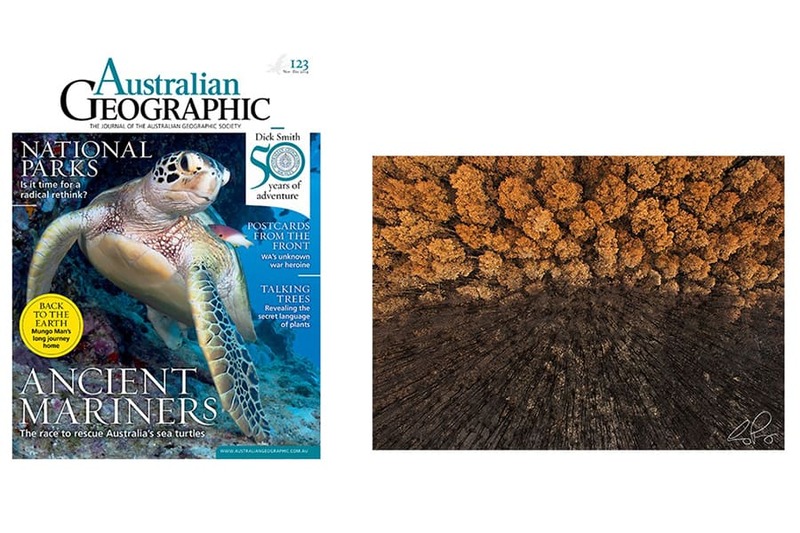 Australian Geographic has published ‘Life and Death’ as a feature image in their November / December 2014 edition.